You know, devoting a day to Link's Awakening reminds me that Nintendo needs to get cracking on releasing their old Game Boy/Game Boy Color library as downloadable titles on, say, the DSi for like three bucks a piece or something. Honestly, would YOU pass on Pokemon Crystal, Link's Awakening, or one of the Super Mario Land games for three bucks? I didn't think so. Anyway, back to Link's Awakening, the first Zelda title on the Game Boy and also the first one I actually beat. The Legend of Zelda: Link's Awakening was an oddball in that it was the first Zelda to completely ignore the Triforce, Hyrule, and even its namesake Princess Zelda. Instead, you help a shipwrecked Link find his way off a mysterious island. The usual Triforce is gone and, because of that, so are any ideas of princesses or guardians of said magical relic. Instead, your job is to collect eight different instruments to play the Ballad of the Wind Fish as it's the only way to wake the mythical beast and get off the island. Other than that, the game plays very much like Link to the Past. One of the things I remember fondly about the game is how much it doesn't take itself too seriously. Zelda II and Link to the Past are very serious affairs whereas Link's Awakening ends up with a pretty lighthearted cast and even throws in other Nintendo mascots along the way. For instance, you'll be fighting Goombas, using a claw game to get Yoshi dolls, and taking a Chain Chomp for a walk. You also use telephones for hints and are constantly told to hit buttons as opposed to swinging a sword or using an item. Considering I was 11 at the time of its release, that may very well have been what drew me into the game and the series more than the previous three Zelda titles, all of which I played but didn't beat before that. That isn't to say the game was a senseless parody. 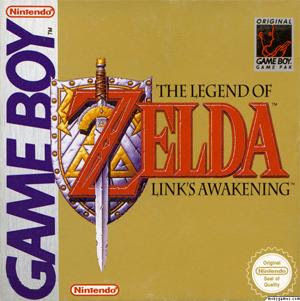 In fact, of all the Zelda games out there, Link's Awakening is the one I attach to the most. The two characters that help you out at first, Tarin and his daughter Marin, become more memorable than even Zelda or Ganon had been in any Zelda before it. And instead of hunting for magical pieces of the Triforce or random crystals or pendants or some crap, you're seeking out instruments. That sounds silly to put into the "attachment" category, but in all honesty there really isn't much out there more emotionally binding than music. And, speaking of which, the haunting "Ballad of the Wind Fish" is the only Zelda tune that has the ability to bring a tear to my eye. As far as the gameplay itself, it does surprisingly well for only being able to use two buttons after getting used to the SNES controller's whopping six and even evolves the Zelda formula a little bit. For example, you find an item that allows Link to jump, which is something he couldn't do in previous top-down titles (yes, he could jump in Zelda II, but since it was a side-scroller it would have been pretty dumb if he only walked). There were some pretty good item combinations as well, such as using the dash boots to jump further, and the puzzles were well designed for such a small game. And, finally, going deep into some dungeons or other areas involved a side-scrolling portion of the game, complete with Goombas and platforming. Overall, it really made the game feel entertaining and full the whole way through. Link's Awakening is considered arguably the best Zelda in the series by some and easily the most fun by my standards. These days it's a difficult one to find and, because of that, one a lot of people will probably go without playing until Nintendo decides to cash in on the downloadable goldmine that is the GB/GBC library. I actually think the day they say "Link's Awakening is available for download on the Nintendo DSi/3DS/money-printing-device-here" is the day I upgrade my DS. I'm not a huge Zelda fan these days but, thanks to Link's Awakening, I'll always hold the series near and dear to my heart. Also not a huge Zelda fan, but I'm thinking about sitting down and beating them one of these days. I think I've started every single one of them, but never beat any of them. I just recently finished this game via the supergameboy. I was amazed at the detail and complexity of it considering it was released as a handheld game. It was, without a doubt, on par with A Link to the Past. My hope is that nintendo somehow recaptures the perfect blend of puzzles, combat, difficulty, pacing, and overall ingenuity that was present in earlier masterpieces like ALttP and Links Awakening, and puts it into future Zelda games that I may come to cherish for decades as well.